The Washington Post: The uninsured rate is at a five-year low. Is Obamacare the reason? 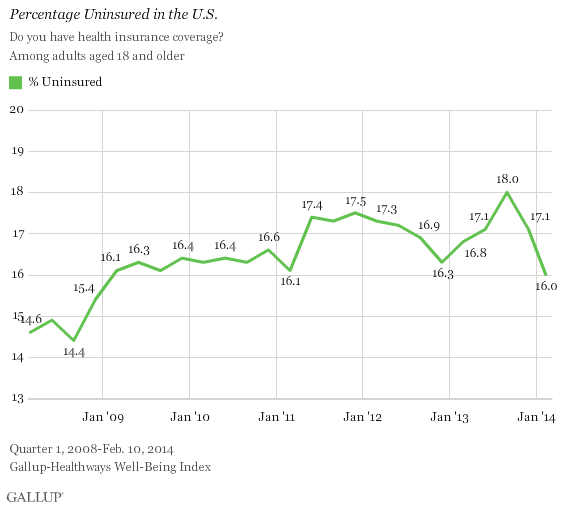 Gallup’s newest poll shows another decline in the uninsured rate, in a survey taken in late January and early February. It found that 16 percent of American adults reported lacking insurance coverage, the lowest number Gallup has recorded since 2009. This follows on a very similar Gallup poll from last month that showed a similar drop in the uninsured rate. What’s more interesting about this one, though, is it includes a breakdown of where people are getting health insurance–one that would suggest the health-care law played a role in this new drop. It shows that more people report getting their health insurance through the individual market and Medicaid than in the last quarter of 2013.